So far from these lists I have Chili, Meatloaf, Cheesecake, Pancakes, Quiche, Meatalls and Banana Bread recipes on my blog. I also have a recipe for Maple Pecan Bread which is a very similar quick bread. Do you notice that all of these recipes are for everyday comfort foods? And Banana Bread is on all three lists. I was intrigued as to what Eton Mess was and found it is an English desert made up of strawberries, broken meringue cookies and whipped cream. Fondant Potatoes are cut in a barrel shape, poached in chicken broth until it is a glaze, then roasted in the oven until crisp and brown. Cauliflower Cheese is a cauliflower gratin made with cheddar cheese. Similar to mac and cheese. Coronation Chicken is a mayonnaise-based chicken salad usually flavored with curry powder and eaten cold as a salad or on sandwiches. So now I’m adding another quiche recipe and it’s a really good one. I love the shredded potato crust and the peppery green salad on top. This is perfect for a light lunch, brunch or a starter for a special meal. I cut it in serving size pieces, wrapped them in plastic wrap in a zip-close bag and froze them. Today I microwaved my portion for about 3 minutes, covered, and it was as good as when it came out of the oven. I just love food you can freeze! 1. Preheat the oven to 400 degrees F. Butter a 9-inch glass pie plate with 1 tablespoon (or less) butter. 2. Using the large holes on a box grater, shred the potatoes. In a large bowl, mix the potatoes, onion, cornstarch, ½ teaspoon salt and ¼ teaspoon pepper. 3. In a large nonstick skillet, melt 1 tablespoon butter. Transfer the potato mixture to the skillet and pat into a 10-inch disk. Cook about 10 minutes until the bottom is golden brown. 4. Loosen potatoes and place pie plate top side down onto crust. Flip over, browned side up, onto the pie plate. Using your palm, move crust so edges are even around rim of plate. Bake about 20 minutes. 5. While the crust is baking, heat the skillet over high heat. Add the spinach and ¼ cup water. Keep turning with a tongs until completely wilted. When cool enough to touch, squeeze out as much water as possible by hand, then wrap in paper towels and squeeze again. Chop in small pieces. Reserve. 6. Heat 1 tablespoon butter in the same skillet over medium heat. Add the mushrooms and cook until brown and liquid has evaporated, stirring several times, about 10 minutes. 7. Add the spinach to the mushrooms and season with salt. Put half of the spinach mushroom mixture in the crust, sprinkle the Swiss cheese evenly over, then the parmesan. Put the remaining spinach mixture on top. 8. In a bowl, mix together the eggs, egg whites, milk, ½ teaspoon salt, and ¼ teaspoons pepper and nutmeg. Pour over the filling in the pie plate. Elevate the top mushrooms that are submerged so they will show when finished. Think presentation. 9. Bake 20-25 minutes until set. Let cool about 20 minutes before cutting. 10. Whisk together the vinaigrette ingredients in a medium bowl. Add the salad greens and toss to coat. 11. Cut quiche into quarters, place on serving plates and top each with 1 cup of salad. Eat! Very interesting lists! That will definitely make a blogger think! 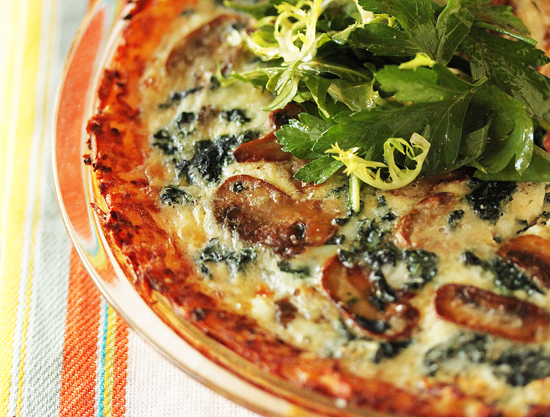 Love the looks of your quiche–especially the crust! LOVE the potato crust. Why didn’t you use all the egg yolks? I love the thought of a potato crust. This would make my quiche experience something entirely new! And I so appreciate those lists you posted…how interesting! I would have never thought that meatloaf would have ranked so high. But I’m not surprised about banana bread…everyone loves it, and how could they not? Such a fun post! It was really fun reading what all the top 10 were for different cities. Would never have guessed that banana bread would be so world renown in popularity! 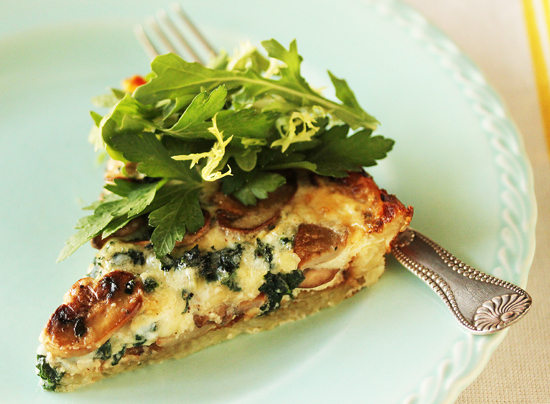 This quiche looks delish, I’ve made frittatas before, but never gotten around to a quiche. The potato crust sounds much more clever and tasty than the original! Andrea ~ This quiche recipe is supposed to be a lower fat version, hence, no pastry crust made with butter and less egg yolks. Of course, now I have two egg yolks in my frig. Maybe I’ll have to make more of those Twirly Lemon Cookies that only use yolks. Any ideas? Eaton mess is a favorite last minute dessert at our house. It really is delic! Food you can freeze is also a favorite, since all you often want is a ready, home cooked meal. I never thought of portioning and freezing quiche. Thanks! The potatoe crust is awesome! I recently read a post about a rice crusted quiche too….everyones going healthier these days…i like! Hey Lynne, those lists are just smart. I’m going to make all of the vegan/vegetarian items on them (smile). More importantly though, your potato crusted quiche looks wonderful. It’s so much more healthful than an A.P. flour & butter crust, plus it sounds delicious anyway! I’ve made a cauliflower quiche-type dish with a grated potato crust from the Moosewood cookbook several times. It’s pretty good but time consuming. You don’t fry the potatoes though. Just bake them in the pyrex pan first. Your crust sounds more like a latke which is probably tastier. I think I’ll try this but I’ll use shitakes. Yum! What fascinating lists. I feel like I ought to just Google “coronation chicken” and “fondant potatoes” now, since being in the States, I have no idea what those are. But boy, do they sound good! Make mayonnaise with your two egg yolks. 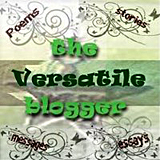 As for the rest of your post, wow, what interesting information re: the top 10 searches! I’m a big quiche person, so now I’m wondering why I’ve never blogged about it. Might be time to get on the bandwagon. The potato crust is a new idea for me – might have to try that next time! Well I know that when I need to find a quiche recipe I’m not going to Google it, I’m going to Cookandbemerry it! I never tried this shredded potato crust, although seen it before…the quiche looks awesome…no wonder it is so popular…will have to try it soon. Thanks Lynne! Tasty! 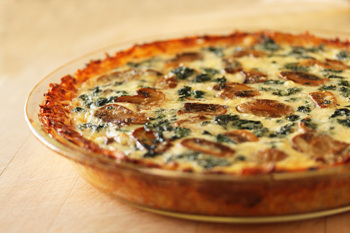 Oh, how much I love quiche, and this one really really looks good! I made this quiche last week and the potato crust was awesome! I loved that it was crisped up in a skillet as opposed to baking it in the pie pan first. I am making it again this weekend for guests and will be trying it with sweet potatoes.